Although not physically present, so many people knew about Jordan's battle for life. The memorial will hopefully be a beautiful memory of his life. We will have the opportunity to share Jordan's Legacy, a post intended for his site but we saved it for the memorial. There will also be a short video and Celebration Community Church was generous enough to accommodate us. Our hope is that everyone leaves having the opportunity to have been as close to him as possible. Jordan is greatly missed and was such a beautiful baby boy. We are proud that he is our son. Plans are falling into place as we look forward to the memorial this Thursday at 6pm. Baby Jordan touched a lot of people and we want to make the memorial special. As hard as it's been, we find that it helps us emotionally to work through some of the material. It reminds us of Jordan and our journey together. It is simply amazing that we were connected with the pastor that we had blogged about while in Philadelphia. He has been wonderful at helping us gather our thoughts and emotions during this difficult time to plan the memorial. It is a small world after all. So many people are either working hard to prepare or are offering assistance. It has been truly a blessing to see how many people are willing to help. Services will be held at 6:00 p.m. Thursday, December 1, 2011 at Celebration Community Church in Hays. Hays Memorial Chapel Funeral Home is handling the arrangements. All who would like to attend are invited to mourn with us, as well as celebrate the life of baby Jordan. Our arrival home wasn't dramatic. We rolled in under the guise of night. By three in the morning, traffic was sparse. It was strange to walk into our house after all this time. Our first comment to each other was that it looked better than we remember. Caleb barely slept at all on the way home because of his anticipation. His reaction upon seeing our home for the first time in months was priceless. He slowly took it all back in as he began remembering his own toys and bed. Every room was inspected and named before he could calm down to go to sleep. "This is Caleb's room. This is Mommy and Daddy's room. Here's my toy box with all my toys." Although hard to comprehend that Jordan cannot be with us, we are very glad to be home. Many thanks to everyone who helped purchase food and stock our refrigerator and pantry for our arrival. That was very thoughtful and helped more than you know. It's funny that he even remembers, but big brother Caleb has been asking to go swimming ever since we arrived in Philadelphia back in August. Daddy finally granted him the request and booked a hotel in Effington, Illinois with an indoor swimming pool. Caleb had a blast and thanked us all evening saying, "That was lots of fun!" Let's just say he's going to enjoy being the center of attention again. Thanksgiving. One of our favorite times of the year. Typically, it is a time set aside for rest, enjoying the company of those we love and giving thanks for our blessings. In reflecting, this may be the first Thanksgiving either of us haven't spent with our families. Our Thanksgiving Day plans this year included attending the big Thanksgiving Day dinner at The Ronald McDonald House and spending some time with our host family. Our hope was that Jordan would be doing well enough that we could take a break from the hospital. It was not in our plans to be driving home today. As we traverse the long stretch of road between us and home, we can't help but feel lonely. We all miss Jordan greatly. He was a precious little boy and our time was cut short. Today, we have a deeper understanding of Thanksgiving. We thank God for those special 34 days we had with Jordan. We are thankful for His provision for making this trip possible. If it wasn't for our time at CHOP, our time with Jordan would have been much shorter. We are so thankful for Caleb. The time we spend together as a family is so precious. Although this is not a happy Thankgiving for our family, we are filled with a deep sense of peace. Hoping that all of our family and friends have a peaceful Thanksgiving. It took all of what little energy we had left to pack for the trip home. We had packed for three different seasons and picked up some items along the way. It's a wonder that all four of us fit in one small room for so long. Our whole trip was planned around bringing an infant home. We all miss his presence. Everything from packing to leaving town was difficult knowing that Jordan - the reason we came - would not be traveling with us. It took us all day to finish packing, but we were ready to hit the road anyway. We made it to Somerset, PA - almost to Pittsburgh. We have a long drive ahead of us. I want to thank all of you for your support of the LaFond family. In this time of need so many of you have offered to help and inquired as to how you may stand with them during this difficult time. I would like to thank Michael and Brandi for allowing me to post this message on behalf of their local community of friends in order to communicate some ways each of you can be of support to them. They truly cherish your comments and words of encouragement. Continue to post comments to this blog or use email or facebook to let them know how this journey has impacted you and that they are in your thoughts and prayers. You can also contribute using your credit card. Just click the "Donate" button on the right side of this webpage. Your support in this area would certainly help to ease the pressure of the financial obligations they face. For those of you in the Hays area, we have started a list for individuals who are interested in providing the LaFond family a meal. Please email Heather Jamison at hljamison@gmail.com or call her at (785) 259-6773 if you are interested. She will coordinate scheduling and other details. As more details regarding the memorial become available, additional information regarding their needs will be posted to this site. Please check back regularly as further details will be posted soon. All of the individuals who are part of the LaFond's local community of friends greatly appreciate your consideration and support. As we left the hospital for the last time, it was hard to comprehend that we would never return. No more trips to the hospital to spend time with our son. Our lives were turned upside down and inside out to be here for our little man. Now that Jordan has move on, we just want to go home. Even Caleb knows that it's time. He wants to know where his friends are and where our "blue house" is... Caleb will soon be able to find comfort in his familiar routine. We will miss the company of our new friends in Philadelphia. Our host family, Paige and Jim, became our family in their love and support. The ECMO team at CHOP had no choice but to spend every day with us as they supported our son's life. They are exceptional at what they do and were welcome company. They were always willing to answer our questions and provide a sense of stability when things seemed out of control. The nursing staff that provided Jordan's care 24 hours a day; especially Kristen, who appeared to be Jordan's favorite. He had his best days of life when she helped with his care and she was there the day of his death as well. It was her caring touch that made that dreadful day as beautiful as it could have been for us. We have nothing to hold us here anymore. Our plan is to leave Philadelphia today. It will take about three days to get home. The long drive will be therapeutic. Jordan's site will continue to be useful. We are working on the details of a memorial and will continue to post updates as we can. Jordan did not respond to Flolan last night. His numbers have continued to fall little by little. They continue to modify the dose but they are running out of room. They will monitor him very close today. Jordan will need nothing short of a miracle to heal now. Both CHOP and Jordan haven't given up yet and neither have we. "Hello. My name is Dr. Brian Hanna and for the next three hours, I will be your tour guide." As Dr. Hanna introduced himself, we were both honored and terrified that he drove an hour and a half to be here. We have heard that Dr. Hanna is considered to be the best pediatric cardiologist in the world. For at least the second time as parents, we received a quick tutorial plus a bonus sketch about our son's insides (we had this done with Caleb regarding a condition). The lesson hit like a tidal wave. We've just had instruction on the cardiovascular system by a world renown doctor. The lesson: our son has extremely severe hypertension. For the last two days, we have experienced Jordan's second honeymoon. This is the phase where the patient fools everyone into thinking they're doing okay when, in fact, they are suffering from pulmonary hypertension. Jordan is very sick. They are waiting to see just how sick. The hope is that Jordan has enough blood vessels to relax in his lungs so they can grow and heal. The concern is that he does not have enough pulmonary vessels to relax and perform the exchange of oxygen. On a chart comparing blood pressures to the number of blood vessels, he showed us a scale ranging from "oh my God" to "normal" and circled "oh my God" for Jordan. The most important indicators they watch now are acid, urine and low blood pressure. It is going to be a long night of tweaking and very close monitoring. The cardiologist was called in and is on his way so that he can be by Jordan's bedside. Jordan just had his fourth operation since Friday afternoon. A direct acces line was placed in the left side of his chest. The Flolan medication has been ordered and will be administered through this line along with blood pressure medication. Flolan, if responded to properly, should work to open the blood vessels in the lungs and allow the blood to be pushed through from his heart. Everyone was surprised how well Jordan handled the operation. He barely lost any ground when they placed the line - thank God! The team is doing everything they can and Jordan is battling. We sure hope the medication can ease the pressure for tonight. Jordan has continued to desaturate all day today. This is it for Jordan. They either find out what's wrong in the next several hours or they've run out of options. Pulmonary hypertension is the evil result of the hernia. 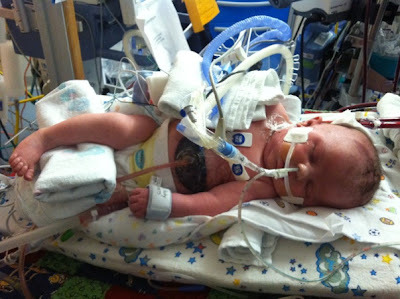 Although Jordan's lungs are open tonight, his heart is unable to push blood through the lungs for adequate oxygenation. The result: Jordan is not getting enough oxygen to the rest of his body. The right side of his heart is overworking. The left side of his heart needs more blood to push to the rest of his body. The cardiologist called us this evening to let us know Jordan is rapidly running out of options. They are going to give him a lung medication called Flolan to help relax the pulmonary vessels. This medication is not usually given to infants and is a last resort to help the heart not have to work so hard. We feel like Jordan's body is working on something which is causing tension on his pulmonary vessels. They just haven't figured what is causing it since he was doing so well this morning. We continue to thank God for Jordan and hold hope dear. Anyone who has had a baby that suffered from pulmonary hypertension would understand how we are feeling today. Hour by hour, minute by minute, Jordan's stats can rise or fall. Alarms pierce through the sound of gentle rhythms created by the oscillator. "Beep,beep!" Every time they sound, you can feel your heartbeat race and thoughts come crashing into focus, "Was that Jordan? Which alarm is sounding?" It is a terrible game of numbers because our son's life depends on them. It is so easy to get pulled into watching the numbers constantly; or at least letting your emotions get twisted and churned in the process. It is almost impossible to break away; especially since Jordan just came off ECMO. Mommy was thankfully able to do just that today. She stayed at the Ronald McDonald House with Caleb. Our hope is that she can spend qaulity time with him and avoid watching numbers today. It is emotionally draining to say the least. Relatively speaking, Jordan is doing good this morning. He is stable and his blood gas looks good. His chest x-ray appears to be a little better too. The right lung opened up a bit more. What's concerning is that although Jordan appears to be doing well, he continues to slightly slip backward in that his level of support keeps increasing little by little. This journey has stripped us bare. All we have is love... Love and support from others. Love from God our Father. Love for each other and our family. Nothing else matters. We have a promise that we knew Jordan was going to be a fighter. And that has turned out to be very true. Jordan is fighting. We know that God has Jordan and we continue to praise him for filling our son's lungs with breath. Sadness has filled this hallway this morning as another child we know who is battling CDH is not going to make it. Our love, thoughts and prayers go out to this family. They are friends and are dearly loved. We understand the torment this journey has put them though. Questions fill our thoughts that will never be answered. All we can do is share our love. After a long, emotional day of ups and downs, Jordan ultimately had a pretty successful day. We watched helplessly as his saturation and corbon dioxide levels climbed and fell all day. We left Jordan on a positive note this evening. He was able to lower his carbon dioxide level almost to normal and raise his oxygen saturations back up to a healthy level. The plan for tonight is continued therapy to try and open the right lung. This will include suctioning him out and chest percussion. Hoping for a safe night and a good x-ray tomorrow morning. It's funny how the human psyche works. In the back of our minds, it's almost as if we expect to hear some great news that will allow us to catch our breath. Something to the tune of "Yes, Jordan had a great night! Things are looking much better." There are five other families with babies here at CHOP being treated for CDH. It is common for all of us to have similar feelings. It's just not the nature of CDH to be kind or predictable in any way. Although we are all here receiving similar treatments, every one of us has had different experiences. Three of us first heard about CDH before 22 weeks of gestation. One couple had one of the most heartbreaking, thrilling and entertaining stories we've ever heard. They discovered their baby had CDH at 32 weeks of gestation. They were told their baby didn't have a chance. They scheduled a consultation with CHOP to be evaluated for treatment. Within that same week and the night before their consultation, she went into labor, had an emergency c-section and their baby was admitted to CHOP! This is their first child too. What an introduction to parenting! Every baby has their own personality and different degrees of severity. Some of the sickest kids do well and some of the better candidates do poorly. It is truly unfathomable. Jordan's journey continues today. Last night, a portion of his right lung - the good lung - collapsed. As a result, he continued having trouble removing the carbon dioxide from his blood and had to be transitioned to the oscillator. The oscillator does a better job of removing carbon dioxide from the body with quick, gentile breaths. Parents are not supposed to view this as a step backwards, but it is almost impossible not to. The goal is to get him back on the ventilator for normal modes of ventilation. The oscillator does appear to be working - his carbon dioxide level has reduced dramatically and the right lung has opened part of the area where it collapsed. The best news so far today: since Jordan is no longer on ECMO, his left lung actually has more volume on the x-ray! It's bigger than we thought! They may even be able to remove the chest tube today. They know either one of two things has happened. Either the chest tube has stopped working or Jordan has gotten the bleeding under control. Dr. Adzik agreed that either way, it is time to remove the chest tube and see what happens. The entire team is in agreement today. Given how severe his condition was and the road he's had to travel, Jordan has responded the best he could have. We press on with hope that we hold dear. Thank you God for the breath of life. Overall, Jordan made great progress for his first month of life given all the challenges he has faced. He made it about four or five days before going on ECMO. He had a successful repair of the hernia. Tonight, he was able to come off ECMO. In terms of milestones in overcoming CDH, Jordan has made great progress. He still has a challenging road ahead of him. His lungs need to continue growing and his hypertension will need to improve greatly. Jordan has defied the odds so far. His liver was "up", which was the most significant indicator of how severe his herniation was. He was on ECMO for 26 days. The average length of time a CDH patient is on ECMO is 14 days. It is hard to put into words how severe Jordan's condition is, but he is such a strong little fighter. Just like that - ECMO is gone. It is a welcome feeling. The only part of ECMO that we will miss is the exceptional team that came with it. The Jim's, Lyne, Mike, Chris... They were all exceptional; not to mention, they were around long enough that we got to know them pretty well. Jordan's room seems much bigger without the ECMO circuit taking up what little space there was to begin with. Jordan handled the surgery well. His heart and lungs are doing the work now. At this moment in time, he is on the conventional ventilator and 65% oxygen. That could change at any time depending on what is best for Jordan. It will just take time to determine what settings are best for him. His carbon dioxide levels are a little high - that's the only number that doesn't look to good right now. Dr. Adzik said they had trouble stopping Jordan's bleeding after the cannulas were removed. The heparin should wear off in about four hours. That should definitely help solve so many of the bleeding issues he's facing. They will keep Jordan heavily sedated until his body has adjusted a bit and things start to calm down. Dr. Adzik and the rest of the team began removing Jordan from ECMO at 2:30pm EST. The cannulas are being removed from from the vessels in his neck. No longer will Jordan's oxygenation be performed by a machine. The hope is that he can now recover because his blood will not be traveling over a foreign circuit. There will be no reason to continue heparin. Just before the OR team asked us to leave, Jordan opened up his eyes and started moving his hands and feet. It was if he was waving waving goodbye and letting us know he was okay. We overhead the nurses talking about how much sedation he needed. "We need to increase it to 0.3," one said aloud as she saw Jordan move a little. "0.6!" another exclaimed after he opened his eyes. Mom and Dad weren't surprised. Jordan is a big, tough little boy and he's proven that he's hard to sedate. CHOP time went out the window as we found the team busy at work this morning. The pace hasn't slowed down since. The air is thick with both excitement and tension as the countdown has started - Jordan is coming off ECMO today. The x-ray this morning was still not quite what they were hoping for, but it was good enough. The ECMO circuit has started consuming blood products again. The team's hand is being forced a bit. There may not be better opportunity as the circuit may need to be changed. A circuit change at this time would make things almost impossible to overcome. Another round of edema and closed lungs - no thank you! Jordan's tidal volumes continued to improve last night. Tidal volumes represent the volume of lung available on ventilation. This proved to be a deciding factor today. They are performing an echochardiogram to establish a baseline of Jordan's heart function for after ECMO support is removed. It will not be a factor in determining whether or not he's coming off ECMO today. Like busy bees around a beehive, team members have filled the room with constant activity and discussion about Jordan's stats. What's his his blood pressure? What's the flow of the pump? How are his tidal volumes? How badly clotted is the circuit? Is Jordan shunting and why? What medicines are they going to give? When should they order the blood? What's his gas? - We have heard it all! No one was bothered more today than Jordan's Mommy. So many team members prepped us for coming off ECMO today. Ultimately, the timing just wasn't right. Although Jordan has made slight progress, he continues to have issues fully opening his lungs. There are several possible factors and CHOP is working to support Jordan the best that they can. The ups and downs take an emotional toll on a Mom longing to hold and comfort her son. One thought today was that the accumulation of blood in Jordan's left chest cavity continues to put too much pressure on both his left lung and right lung. He underwent another operation today to clean the chest out. Another possibility is that although Jordan has lost pretty much all of the edema, the lungs still may be retaining some fluids. That would be consistent with the night before Jordan's surgical repair. They continue to find plenty of fluids when they suction Jordan's lower trachea out. On top of all that, Jordan has severe pulmonary hypertension as a result of CDH. It is more likely a combination of all the above mentioned issues that are affecting the lungs. As we approach the end of the week, the total number of days on ECMO keep adding up for Jordan. CHOP keeps a pretty close eye on that number. As a result, the activity at his bedside has picked up tremendously. Mommy and Daddy are suffering from information overload as they explain the key indicators in determining whether or not Jordan should be taken off ECMO. We are doing a pretty decent job of keeping up, but it is exhausting to say the least. The indicators appear to be lining up for a big day tomorrow. How does the saying go? "Fool me once; can't fool me twice." We now realize that we can't get too excited when they start making plans. The truth is that the team doesn't know what will happen tomorrow. Jordan is on his own time clock and we are all following his lead. The overall consensus today is that Jordan continues to make slow and steady progress. This is definitely a journey of endurance - Jordan is hanging in there and so are his parents. Sitting at Jordan's bedside, you would think you're in a science laboratory, not a hospital room. The familiar sound of a water fountain fills the room as his chest tube now has a vacuum attached to it to help stop the clotting that has plagued him. Red, green and blue lights fill the room from all the light indicators on the equipment. Air flow leaking around Jordan's endotracheal tube makes it sound like he is making duck calls. All of the support Jordan has received has led to this night. Jordan's lungs have have started registering tidal volume on the ventilator. This means that his lungs are responding to the air pressure from the ventilator and holding volume - he had to start doing this to come off ECMO. After our post last night, we called the hospital around 2:00am to check on our son. The nurse informed us that the x-ray was worse than the day before. Needless to say, that was a hard pill to swallow and we had difficulty sleeping the rest of the night. When we arrived at the hospital this morning, we discovered a positive transition in discussions as the team made plans for the day. We had been misinformed last night - Jordan's x-ray was much better than the day before. What a relief to say the least! Jordan is being treated with surfactant. Surfactant allows the alveoli to remain open. If babies do not have enough surfactant, the lungs cannot remain open and they collapse. It appears that a combination of the surfactant and the nebulizer treatment is helping Jordan greatly. The team is making plans to take Jordan off ECMO tomorrow. Many thought about trying today but Dr. Adzik made the final call that he didn't think Jordan was ready. So far, it appears that was a good decision because Jordan has made slow and steady progress today. Ultimately, Jordan will come off ECMO when the time is right for Jordan. If they feel like he's getting pushed too hard in trials tomorrow, they'll back off and give him more time. It was brought to our attention that friends and family are fasting today as a result of an invitation being passed around on Facebook. The event is simply called Fast for Jordan. We loved the idea and are desperately praying for our son. Mommy, Daddy and Grandma LaFond will be participating in the fast today to make additional time for prayer. We started our fast after supper last night and will continue until supper this evening. Anyone is welcome to join in however they would like to participate. One of the couples we have have come to know here almost lost their son yesterday. We haven't seen or faced anything like this before. We are hoping for good x-rays tomorrow. These are critical moments for Jordan. The team listened to Mommy's advice and gave Jordan the nebulizer treatment today, which seemed to help. They will also give him medicine tonight to try and help the lungs stay open. Jordan had a "cloudy" x-ray tonight that may have been the result of medicine in the lungs. We sure hope that's the case since the medicine can be absorbed. His hands and feet were blue today. It appears that the additional blood products helped him get his color back this evening. We received good advice from a friend tonight: that there is a reality outside of life at the hospital. We are with Jordan everyday by his bedside - through all the ups and the downs. What we see and what we feel are two different things right now. Jordan's x-rays have been confusing to say the least. His lungs looked great last night and then he had a disappointing x-ray this morning. He had a great x-ray this afternoon and then a disappointing x-ray this evening. That's what we see. What we feel is hope. Confidence that baby Jordan is resilient. Faith hat God has this child in his hands. Love that surpasses understanding. As our son's life hangs in the balance, we have to know who God is and who we are. We are where we are supposed to be. We are confident in the person God created Jordan to be. Let thanksgiving and praise spring forth from our mouths - no complaining here. This is Jordan's story - and we are so thankful for our beautiful son. The emotional highs and lows continue this morning: Jordan swelled up again last night. His blood pressure was low yesterday so they ordered more blood products to pump him back up. It worked; although a little too well. Jordan has accumulated too much fluid again and will need to pee it back off. His chest x-ray still doesn't look good. We can tell that the medical team now feeling stressed as well. They have started discussing other options down the road - including giving up. Jordan hasn't responded to any of their treatments to open his lungs. It is hard for parents to have these discussions. We are invested emotionally and spiritually in our son's progress. We hold on to hope and continue to believe that Jordan will not give up. With sincere gratitude we want to thank everyone who is praying for our son. It gives us hope and strength to know how many people are lifting him up in prayer. "Lord, you knew our son before he was born and he was beautifully and wonderfully made. We worship you as the God who fills Jordan's lungs with the breath of life. We pray for Jordan's x-ray Father - that he would be able to sustain life on his own and come off of ECMO. Amen." It's amazing how much you miss the tiny moments in life when facing circumstances that make those moments all but impossible to come by. We haven't had the opportunity to rock our baby, or burp him, feed him or even hold him in our arms. All we can do is watch, wait and pray from his bedside. Although we can't honestly say that we've ever looked forward to changing a dirty diaper, there's something to be said about how meaningful that time can be. In the midst of everything going on today - medications, stripping the chest tube, V.A.C dressing changes, repositioning, sedation, and ventilator setting modifications to name a few - Jordan woke up just long enough to give us a precious moment today. He opened his eyes and looked right at Daddy. Jordan has done this before, but today was different. Jordan looked as if he knew who Daddy was. He appeared to have a great sense of peace - he knew his Daddy was there. We almost lost it right there at his bedside. We have grown tired and weary of seeing our son on ECMO. Somehow, Jordan looked both calm and longing in the same expression. We took the opportunity to assure him of how much he is loved and how proud of him we are for fighting everyday. As busy as it was today, not very much was actually accomplished. His lungs are open, but not yet to the levels required to remove him from ECMO. That's where Jordan is at in his journey - he needs to come off ECMO. Jordan continues to make progress today. His urine output has continued to increase and he has lost pretty much all of the inflammation. His right and left lung are both open, but we are waiting on the left lung to really pop open like it did before his repair. This morning, they placed a bronchial cuff in the endotracheal tube. Jordan's endotracheal tube was leaking. At times, it actually sounded like he was snoring. It was important to make sure that they could control the amount of air volume they were giving Jordan because they are trying different methods of opening his lungs. The "cuff" can be inflated to create a seal in the airway which will prevent the leak. The team decided to move Jordan to very low settings on the oscillator, rather than the conventional ventilator, as well. This is another trick to try and open those lungs. To make things more interesting, they sent lab work in this afternoon to see if Jordan has a respiratory bug. The ECMO technician and our nurse are both required to wear a mask and gown. They have also blocked off our space so that other teams members cannot enter our room. This seems a little ridiculous to us, but is required for the safety of the other patients. The test is just a precaution to ensure that Jordan is not having trouble opening his lungs as a result of being sick. It may take 24 hours or more to get the test results back. The goal is to get Jordan off of ECMO. The game plan is to try one method at a time to get his lungs to completely open up. Once they like what they see on x-ray, they will try turning down the support settings on ECMO. Depending on how Jordan responds, they can actually clamp the circuit and have Jordan breathe on a ventilator. If everything looks good, they will take the opportunity to remove Jordan from ECMO. That will be a very important milestone for Jordan that will bring on a whole new set of ups and downs. The transition off ECMO may occur as early as tomorrow or Wednesday. It started with what appeared to be a setback. Jordan's chest tube had stopped draining last night. The sonogram made it appear that is wasn't due to a blood clot in the chest - today proved otherwise. The team decided to go into the chest tube and clean out an accumulation in Jordan's chest. Although they couldn't be certain this early on, the team thought that another blood clot was forming. On top of that, they decided another chest tube would need to be inserted - this time, on the the right side. The operation was successful. About 50 milliliters of blood was removed from Jordan's left chest. They were also able to determine that the chest tube on the right side was not needed - Jordan was laying a little sideways in the sonogram. After they removed the blood from his chest, the left lung opened up (which is the smaller of the two)! They were also able to see a portion of the right lung as well. Earlier today, the bronchial scope showed that the breathing tube was completely blocked off with junk. They were able to clean that out thankfully; before it started causing issues. Hopefully, with the progress that was made today, Jordan will continue to get rid of what little excess fluids still remain and open those lungs up in tomorrow's x-rays. Although today was actually Caleb's birthday, the entire weekend was filled with fun events for the little guy. Grandma and Grandpa Legleiter, Grandma LaFond, Mommy and Daddy were able to throw together a birthday party for Caleb on Friday evening. We wanted to celebrate before Grandpa and Grandma had to head back to Kansas. Caleb was very surprised to see that there was such a thing as a Thomas the Train ice cream cake! To our surprise, Caleb received a few packages in the mail as well. On Saturday evening, Caleb thoroughly enjoyed opening cards and presents from both close friends and mere acquaintances. We even heard feedback that he may receive a few more gifts tomorrow in the mail. We wanted to write a special "Thank You" to everyone who has sent something to Caleb for his birthday. It was important for us to spend this time with him and make the memories around his birthday special. The Ronald McDonald House even gave us free tickets to the Please Touch Museum. Ever since Caleb spent time there this summer, he has frequently reminded us that he would like to go back. Mommy and Daddy took a break from the hospital today to take Caleb to the museum. What a special opportunity to take him back there on his birthday. He had so much fun! Caleb is definitely experiencing the impact of being away from home. He has handled the change extremely well. He sure enjoys spending quality time with Daddy when he gets the chance. Today was a special day and Daddy took the opportunity to have fun with Caleb this evening. Jordan has really taken it upon himself to get better. His urine output increased so much yesterday that they decided not to increase Lasix. In fact, his blood pressure was too low and he was dry. They stopped scuffing the volume from his blood products so that he can keep peeing. His weight indicates that he has lost a lot of the extra fluids from inflammation. He has stopped bleeding in his chest tube again; only this time it is not due to a blood clot in the wrong spot. An ultrasound of the chest looked good. The chest x-ray this morning was the same as yesterday - the lungs are still closed. CHOP is going to perform a bronchial scope this afternoon to see why the lungs are having trouble opening. Brandi - utilizing her mommy's instinct - told the ECMO team yesterday that Jordan is coming off ECMO on Tuesday. He has made progress since she made the comment. Only time will tell if she's right. We continue to pray in thanksgiving for the breath of life. Baby Jordan received spa-like treatment today. Okay, so CHOP is not the Four Seasons Hotel, but everything was done to make sure that Jordan was completely comfortable. Throughout the day, he was repositioned, had his fingernails cut, his bedding changed and had the tape residue removed from his chin. Daddy even got to massage Jordan with moisturizing lotion. Jordan apparently liked all the attention. He looked at Mommy and Daddy today as we spoke to him and it appeared that he was smiling at us. The team told Jordan that they are going to increase his Lasix this evening. He took the threat seriously and increased his urine output on his own. They are suctioning him out about every 4-6 hours to make sure they remove the fluids that build up in his airway/trachea. His nurse thought his airways sounded a little better today - still praying for a good x-ray. So far, only the bronchi are visible on the x-ray. Unfortunately, Grandma and Grandpa Legleiter already had to leave today. They made it back to Kansas City safely. We will sure miss them. The pictures below are helpful in understanding what's happening inside Jordan. 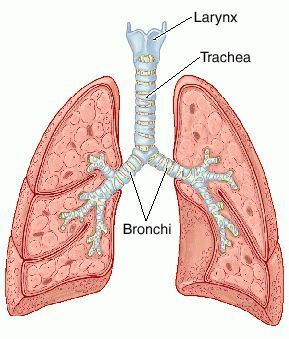 The first picture shows the trachea and the left and right bronchi. When they suction Jordan out, they are suctioning out the trachea. Since his lungs are closed due to inflammation, air from the ventilator only enters the bronchi. Below is an image of a healthy baby's chest x-ray. You can see that the left and right sides of the body appear black and you can easily count the ribs. Also, the heart on the lower left-hand side of the chest. In contrast, in Jordan's current chest x-ray, both sides of the chest appear white where the lungs are closed. The bottom photo is one of the best we found that shows what CDH looks like under x-ray. Jordan has had his repair, so the major difference with him now is that the bowel is not up in his chest. Today was a pretty good day for Jordan. They started Amicar to try and help stop the bleeding. They also started Lasix again to help Jordan lose the extra fluids he's gained from inflammation. He had his vacuum patch changed and his blood loss was less than yesterday. We are hopeful that he will keep making positive steps to get those lungs opened up. A close friend of ours shared a precious story with us today that has inspired us. She was visiting with a pastor and Jordan's story came up in their conversation. The pastor had already heard of Jordan and his family has been praying for us. The pastor's son is a first or second grader. He told a story of how his son had recently prayed for another little boy who was very sick. He felt that they needed to pray for the "paper-clips." It turns out that the sickness this little boy had experienced looked like paper-clips on a microscopic level - a pretty incredible story! After looking at pictures of Jordan from the website, the pastor's son said we need to pray for Jordan's x-ray. We were amazed that a kid we don't know would be led to pray in this way for our son. Jordan's x-ray is actually the critical sign of healing that the medical staff is looking for. He has had so many issues with bleeding. 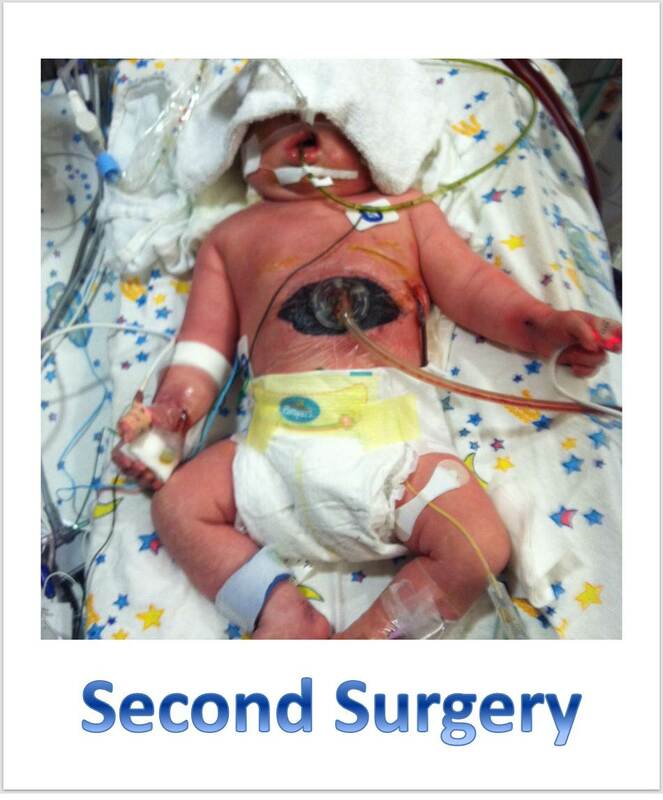 To truly stop this cycle, Jordan needs to come off of ECMO. The only way he will come off ECMO is to have his lungs open up. Jordan has an x-ray performed every morning to determine if his lungs are open or not (the x-ray machine actually looks like a little fire truck - see picture below). Mommy, Daddy and Jordan were all exhausted today. The grandparents helped out greatly by keeping Caleb and Jordan company at CHOP while Mommy and Daddy rested for a couple hours at The Ronald McDonald House. Jordan was able to rest as well. One of the nurses said that Jordan's had lost less than 1/3 of the blood lost yesterday. His urine output has been very good as well; especially for not receiving Lasix yet. The vicious cycle - it's what the parents refer to the ups and downs of this journey. We went to sleep on a positive high and came in this morning on a low. Jordan was unable to stop bleeding last night - even after the successful surgery. He is still losing too much blood. The consequence: they changed the ECMO circuit this morning. The process of changing the ECMO circuit is actually not a big deal. Not including setup, changing the circuit only took about 50 seconds. It is possible that Jordan could have an inflammatory response on top of the one he just had from surgery. This could cause other issues, such as his lungs closing. What's hard for us is knowing that he's on ECMO, after major surgery, and having trouble clotting where he needs to. It is a very significant problem. We are hoping that a new circuit will require less heparin because it is clot free. Less heparin means that Jordan may be able to stop some of the bleeding. The bleeding is occurring in his chest where they had to make the incisions. They said it's like peeling a scab open under water. The scab would have trouble healing because of the moisture alone - his wounds are also dealing with heparin. Hard for us to call this a vicious cycle when they are giving our son a chance to live a full life. But, the ups and downs, twists and turns are very difficult to handle emotionally. We hold hope dear and are becoming stronger as we endure all of this. Baby Jordan is greatly loved! The neonatologist and and attending surgeon had smiles on their faces as they delivered the good news: Jordan's operation was a success. Jordan handled the surgery very well and they were able to remove about a cupful of blood from his chest. You could tell that they are hoping we are turning a corner for the better. The fellow mentioned that the x-ray looked much better as well. They remain hopeful that through the night things will start to calm down inside Jordan and he can heal. At this time, Jordan is stable. His right lung is partially closed and the left lung is fully closed. We need him to get rid of those extra fluids and let those lungs open back up. Jordan desperately needs to come off ECMO, but only when the timing is right for him. Praise God for a successful surgery and for a wonderful medical team! Just what we needed - an adrenaline rush before the surgery. Grandma LaFond and Brandi were visiting Jordan when a connector cracked on the ECMO circuit. Blood had leaked all over the floor and sent Brandi running for the doors. Everything is okay besides the fact that Jordan will need even more blood now. The ECMO circuit did what they designed it to do. Instead of pulling in air to the circuit - and possibly into Jordan - it leaked out because of the negative pressure. We had just visited with the head of ECMO yesterday about his view that an ECMO technician should man the circuit 24 hours a day. This definitely proved his point that something can happen at any time. The ECMO technician said he's seen that happen once in 10 years. Jordan is scheduled to have surgery in about 2 hours (3:00pm Eastern). Two other kids were scheduled ahead of him and we keep getting bumped back. The term we keep hearing around here is "CHOP time". Our tough little nut is sure being put to the test. We found out this evening that Jordan will require another surgery tomorrow. Dr. Hendrick explained to us that Jordan has a large clot that has developed in the left chest cavity. They believe this may be the reason he is not clotting in other areas and is consuming so many blood products. Every time they feel like they're catching up, they fall behind again. Tomorrow morning, they will make an incision in Jordan's left chest cavity and attempt to flush the clot. They will reevaluate based on tomorrow morning's numbers, but he is almost certain to have this surgery. They decreased the amount of heparin he's receiving, which is an anticoagulant. Heparin doesn't actually thin our blood, but makes it harder for our blood to clot. Jordan's blood clotting test showed that the main reason he's not clotting is because he's receiving heparin - not because he's missing anything else. Basically, the goal for Jordan is to now come off ECMO. They believe that this clot may be backing them into a corner. They can't keep up with his blood and they can't get him off ECMO. Jordan hasn't given up yet and there's no reason for him to do so tomorrow. We are hoping and praying they can find this clot, remove it and stop the bleeding. Grandma and Grandpa made it here safely this afternoon. This evening, Jordan will turn 3 weeks old. The team has made their rounds for today and a plan is in motion. An overview is that they are trying to catch up on products and let the lungs heal. Jordan is losing a lot of blood from the chest tube and the V.A.C. patch. They are trying a combination of things to get the blood to clot in Jordan, but not in the ECMO circuit. One of the new things they will try on Jordan today is a specific blood test to try and determine what exactly may be lacking in his blood. For example, he may need factor 7. This test may or may not work. Jordan's chest X-ray looked better today. They will try different vent settings to keep those lungs opened up. We still need him to pee. That will continue to be critical today. Since our home is now the Philadelphia Ronald McDonald House, we have added our address to the right-hand side of the site. We are able to receive mail and packages at the Ronald McDonald House. Mail sent to our house in Kansas is being forwarded and is taking forever to reach the forwarding address. Caleb has a birthday coming up as well. If you feel so inclined, please feel free to send birthday cards to this address as well. Today, Jordan is basically where he was yesterday in terms of status - before last night's events. He has plateaued. We are still praying for pee today. He desperately needs to get rid of the extra fluids in his body. Everyone here (family and CHOP) desperately hopes that he will not need a circuit change. Jordan cannot be removed from ECMO until his lungs open up - his lungs will not open up as long as he retains fluid. We are praying for that window of opportunity to open - when he can be removed from ECMO and placed on the ventilator. They were able to change his vacuum patch today without issue. Although they have not detected anything with the EEG in terms of seizures, the sonogram of his head this afternoon showed a bright spot. The concern is that this could be bleeding in the brain. We are desperately hoping that's not the case. It will take them a while to read the ultrasound and do some more tests. Last night took it's toll on Grandma and Grandpa Legleiter :) They will be flying up here tomorrow to visit for the remainder of the week. Praise God! It took a little while, but after repositioning Jordan's chest tube, it started to flow again. This means they can drain fluids from Jordan's chest and monitor how much output he's had. Also, his arm stopped bleeding! They tried erverything yesterday; even adding stitches. It just wouldn't stop and it was so difficult for us to watch. But, it has now stopped and Jordan seems to like that. He has even stopped having what appeared to be seizures. He has plateaued this morning and we will hopefully be able to get some rest. Thank God for a little fighter! He's hanging in there. Oh how we would love to bring our baby home and all sleep safely as a family tonight! Instead, we are facing the most critical moments of Jordan's life so far. Jordan has developed a bleed in his right hand where they had placed an a-line to monitor his blood pressure. It is a mess... Jordan is on blood thinners to ensure that the ECMO circuit doesn't clot. The negative effect is that his blood can't clot. He has bled so much today. So far, they haven't been able to find the right balance to help the bleeding stop. They were able to insert a larger chest tube, but it was inserted too far. They are going to have to pull it out a little and hope that it doesn't develop another bleed. Jordan is already receiving a lot of blood. He has also developed a clot in his left lung where the tube was inserted. They are unsure of the exact location or of the exact size, but it is causing the chest tube to not drain properly. The plan is to leave it alone at this time. Jordan also began having seizures this evening. His shoulders are shaking and his eyes are rolling back. He will be closely monitored tonight with an EEG to verify if he is truly experiencing seizures and how severe they are. They have already begun giving him medicine to help control the possible seizures. We have all been brought to tears tonight. The only thing that matters to us right now is a safe and healthy family. Knowing what Jordan is experiencing brings deep sorrow upon us. Jordan is a beautiful and innocent baby boy. He is our son. Our family belongs to the Father and we know baby Jordan is in His hands. But, we are pleading with him tonight - heal our son so he can have a future here on Earth. Thank you everyone for your prayers and loving support in this very difficult time. Jordan has been able to potty a little bit today, but the kidneys still are not testing well. There has been a lot of commotion at his bedside for how little is happening. They continue to watch the ECMO circuit closely. The culture they took from the blood was a staph infection. Oxacillin appears to be successfully treating the infection. If the cultures tonight continue to test negative, they will continue treatment of the antibiotic for two weeks. During Jordan's first surgery, a chest tube was inserted in the left lung cavity to drain excess fluids in his chest. Since the organs were removed and the left lung is small, his body naturally tries to fill the cavity with fluid. The concern is that excess fluid can put too much pressure on the smaller lung. Also, the site around the chest tube began leaking today. The tube had clotted and there may be other clots around the inside of his chest. Jordan is being operated on now to try and replace the current tube with a larger one. The risk is that the tube has to be placed near the gortex patch and he is receiving blood thinners. We are currently awaiting the outcome of this operation. The next 24 hours will be pivotal for Jordan. The numbers from the ECMO circuit are starting to reflect inaccurately. This means that either something is going on inside of Jordan, or the ECMO circuit itself will need to be changed. If the ECMO circuit is replaced, Jordan would take several steps backward. We are hoping and praying that this won't be needed. Jordan is starting to wake up a little as the paralytic continues to wear off. He opened his eyes for Mommy and Grandma today. Healing was pretty much the theme of the day - for all of us. Jordan is being monitored closely as he rests. His blood pressure was better this evening, but really no new events to speak of. The rest of us rested as well. Taking full advantage of the extra hour tonight, Mommy and Daddy took a break from the hospital this evening. We played with Caleb and enjoyed an authentic Asian meal that was prepared for supper. Grandma, Daddy and Caleb even had a chance to enjoy a movie in one of the private family rooms of the Ronald McDonald House. Caleb definitely enjoyed the close family time tonight. After a very long night, we can't even describe what it was like to see our son this morning. Nothing can prepare you for seeing your baby on this much support. This is the stage where infants with CDH are the sickest - after repair. Jordan did very well with the first surgery last night. He is having issues with the second. Jordan now has a V.A.C. patch, or vacuum assisted closure over his stomach. This allows more room the organs to rest without putting so much pressure on his kidneys. The patch looks like an air filter or sponge that was laid in the incision. They then apply negative pressure, or a vacuum affect, to the wound. This allows even air flow across the covered organ, which is his liver, so that it can set partially outside of his body without causing necrosis - or death of the tissue. The goal is that Jordan's stomach can heal and reduce the swelling - allowing the liver and intestines to settle in over time. What a parent won't do for their child.... So many people are offering prayers and words of encouragement for our son and family. We need Jordan to pee. Last night, Jordan's kidneys stopped working. This is a result of both the trauma of surgery and the pressure of the stomach contents. Urine is excreted by the kidneys. We need them to heal so that Jordan can get rid of the extra fluids in his body. One way that the team is helping Jordan is by giving him blood. This will allow his vessels to expand and carry fluids more efficiently throughout his vascular system. Right now, they are constricted because of all the trauma. Another issue is that the ECMO circuit tested positive for an infection last night. It will take a while for the culture to tell us what kind of infection. Of course, the hope is that they do not see an infection with everything else going on. He is on general antibiotics now to see if they can heal the infection. Now that we have experienced post-op, it is much easier to understand why they do not try this surgery after birth anymore. It would be way too much trauma for the newborn to handle. A newborn already has to struggle with a new environment as it is. This would be so overwhelming - it is overwhelming even though he had a chance to stabilize first. They had to use what they call a vacuum patch to hold a portion of Jordan's liver. It was too big to fit in his abdomen. They should know within the next 12-24 hours if Jordan's kidneys are okay. We also found out the ECMO circuit is going to need changed within the next 2 days. He will hopefully be able to come off ECMO before then. Jordan's bowels are putting too much pressure on his circulatory system. His legs and kidneys aren't receiving blood. Dr. Adzik recieved the call and is on his way back in. They are going to open Jordan back up and try to relieve the pressure. Most likely, they will have to leave a portion of his bowels outside of his body, which is not unheard of, but very dangerous. Dr. Adzik was cautiously optimistic as he explained the surgery to us this evening and outlined what's to come. Jordan's surgery was very difficult. Everything was up in his chest: spleen, stomach, liver and intestines. There was practically no diaphragm on his left side. In the picture below, you can see the size of the surgical incision. It was significantly larger than what they are used to seeing because the liver was kinked in such a way that made it very difficult to move. Jordan's abdomen was much smaller than a typical baby's. The organs that are supposed to be in the abdomen were in the chest; therefore, the abdomen didn't have anything to grow around. His abdomen is very full now. Dr. Adzik was able to fit all of the organs back into Jordan. As experienced by another family we know, sometimes they have to leave organs outside the body because they can't fit. Jordan's next few hours will be extremely important. Organ tissue doesn't like to be touched. They can become inflamed or bleed. Jordan has accumulated fluids throughout his body. It is important that he pees off these fluids to relieve pressure on his lungs and stomach. This is a dangerous balance to keep because Jordan is dehydrated. They will continue to give him a saline solution to hydrate him, but not too much because of the fluids in his tissue. We can't describe how full Jordan's abdomen is. Over time, the organs should settle in and the abdomen will stretch out. Another major concern is the ECMO circuit. The longer Jordan is on ECMO, the greater the risks that go along with it. The circuit is starting to consume resources, meaning that it is clotting. This is normal but becomes a major concern at this time. The science of how they are trying to manage Jordan's bleeding and, at the same time, thin the blood so that the circuit doesn't bleed is amazing. Basically, if the circuit clots in a way that affects how well it can support Jordan, they would have to change the entire ECMO machine out. It would be like taking 10 steps backward: Jordan's body would have another inflammation cycle, the lungs would close, etc. The window for opportunity to get Jordan off the ECMO circuit looks to be tomorrow (Saturday) or Sunday. Jordan has a very small left lung. Now that the pressure of the other organs on that lung is gone, it has the ability to fully open and operate. Our lungs can grow until we are 8 or 9 years old. While visiting with Dr. Adzik, it was amazing to think that this man had just rearranged the insides of our boy so that he can have a chance at surviving. As we look at our son, it is still hard to take it all in. We want to cry because it looks so painful, so overwhelming. We want to rejoice, because this was such a major step in his progress. He has handled everything so well and that gives us so much hope and strength. They told us that an adult body couldn't handle what this baby boy is going through right now. It was a long day of waiting, but Jordan's surgery started at 3:30pm Eastern. All parents and guests are asked to leave the hall where Jordan's pod is located. All of us are still waiting at this time 6:45pm. We have seen some of the items removed from his room and believe that they must be close. Today is what Michael coined the eye of the storm. Jordan is resting up for a big day tomorrow - the repair. He is stable and the lungs are open. It was a very peaceful day. Tonight, they will slowly ease Jordan to sleep and begin transforming his space into an operating room. It will all be setup the way that Dr. Adzick, the Chief Surgeon, requests - the OR team will come straight to Jordan's bedside. Dr. Adzik stopped by today and visited for a little while. He smiled and told Michael that the clouds are starting to part. He performed his first surgery in 1987. Jordan's current status looks favorable for surgery. His fluids are down and the x-ray of his chest even showed a portion of the left lung today. We will get to see Jordan for a little while early tomorrow morning. The surgery itself only takes about 1-2 hours, but they schedule 3-4 hours at least for the whole operation. It's a big day for Jordan tomorrow! "The greatest oak was once a little nut that held it's ground." Jordan is holding his ground and fighting for life. He had another wonderful day today. Everyone was impressed and excited about the difference one day made - Jordan's right lung looked impressive. Even the atmosphere was lighter in Jordan's room today. It was amazing to watch Jordan make this progress almost entirely on his own. The team was great and they helped loosen his fluids with positioning, the nebulizer and chest pounding (percussion therapy). With that being said, the head of the ECMO team explained that Jordan began to break things up on his own or he wouldn't have made so much progress overnight. They pushed Jordan even harder today by slowing the ECMO circuit down for an echocardiogram. Dr. Adzik ordered the test as a baseline as we move forward. To conduct the test, they slowed the circuit down and enabled a bypass in the circuit so that Jordan's heart was doing as much work as it possibly could with him on the circuit. It's the first time he's been pushed since going on ECMO and we watched as he handled it beautifully. The technicians couldn't tell us the results but we could tell they were very pleased. Dr. Adzik, the chief pediatric surgeon at CHOP, actually came to Jordan's bedside today. It is very rare to see Dr. Adzik at the patient's bedside. He is always in the loop and keeps track of things from upstairs. It was very interesting for us to watch. 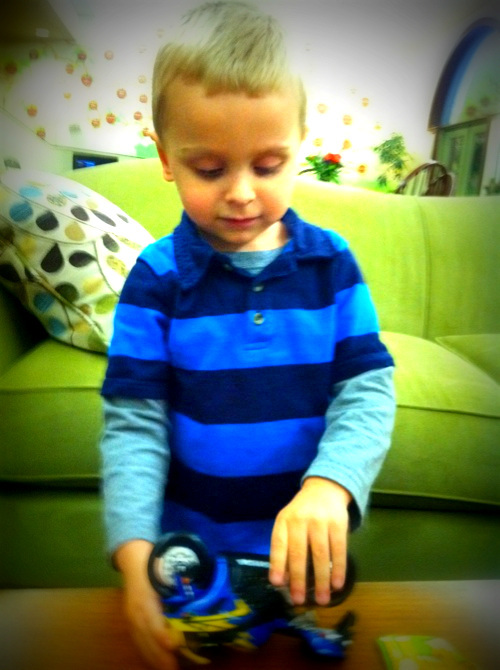 Dr. Adzik approached Jordan's bedside with his assistant at his side. After looking at Jordan he turned to us and said, "He looks good. The surgery will be performed on Friday." Then, he asked how we were doing with everything. "Good," we responded. Dr. Adzik smiled and turned to leave the room. You could feel the rest of the team in the room (at least 6 other people) sigh a breath of relief. He was only in the room for about 15 seconds. We thought this experience was interesting and partially funny because it was like God Himself had spoken. Dr. Adzik is a star at CHOP because of his status in the medical field. His respect is well deserved because he has had so much influence in his field. It was his experience that weighed heavily in our decision to choose CHOP for treatment in the first place. The NICU at CHOP was also ranked #1 in the United States. Dr. Adzik is very hands-off. He will operate on Jordan this Friday, but the whole process up to this point and throughout Jordan's stay is managed by the professional team they have put together. They have an excellent team, from the nursing staff to the ECMO team and respiratory therapists. Jordan is handling his care well and we have great hope for the road ahead of him. The repair will be done on ECMO, which runs some extra risks. Bleeding can be a major issue since they have to thin his blood on the circuit. Also, the machine could clot and they may have to change the entire circuit. If this occurs, Jordan may have even more inflammation. The reason they decide to perform surgery on ECMO is that Jordan is stable right now and his lungs are open. They use the window of opportunity when they can get it. After surgery, Jordan will probably remain on ECMO for another two days or so as he heals. At that time, they will perform surgery to remove him from ECMO and transfer him to a ventilator. This is a lot to put a baby through, but as we mentioned before, Jordan is one tough nut. We just got the news that Jordans's lungs opened back up! Daddy sure thought it would happen last night. Now we are preparing for the next phase: surgical repair. Dr. Adzik will determine if Jordan should be repaired on or off ECMO. Both options have risks and benefits. They will let Jordan determine what he can handle by adjusting the ventilator and the ECMO circuit to see how he reacts to the changes. Timing will be extremely important over the next several days. They are only able to see the right lung on the chest x-ray. This is not uncommon because the left lung can be hidden behind the stomach, which is in the left side of his chest. Only after the repair will they be able to determine the left lung volume. We believe he has lung volume on the left side that will need time to heal, but we will have to wait and see. From the comments on Jordan's picture yesterday, many people have said he looks a lot like Caleb. Daddy's comment was, "God is gracious. He made our sons to look like Mommy." Mid-afternoon today, Jordan's lung fluids started breaking up and moving around! This is a good indicator of Jordan's progress. We are waiting for Jordan's lungs to open up. He is back down to his birth weight - meaning that he has lost the excess fluids gained during the inflammation process of ECMO. CHOP believes the only reason that Jordan's lungs haven't opened already is because the fluids have hardened from being stationary for so long (the mucus is thick). Jordan began gagging today from a cough reflex - just like we would have an itch to cough. The only thing is, he cannot cough or cry. It looks very painful if you watch his face, but he has handled it very well so far. This reflex means the fluids are breaking up and the lungs will continue to have a better chance to open up. CHOP may put Jordan on a nebulizer tonight to administer a salt water solution to draw out the extra fluids. It is very possible that Jordan's lungs may open up by tomorrow morning or Thursday morning! This is Jordan's ninth day on ECMO already. Things are moving forward for Jordan and some big decisions are coming up in regards to the timing of surgical repair. Jordan is almost two weeks old and had the best day he's had in terms of stability. Jordan has been easily agitated by the presence of others or physical touch. Today, however, he was able able to recover and calm down on his own without needing rescues (additional drugs to calm him down). For the first time, he did not appear to be crying or struggling when awake and looking at us. Brandi played Plumb's album Blink for him today and he seemed to really enjoy listening to it. Today was an emotional day - but not because of baby Jordan. Both at CHOP and the Ronald McDonald House, we are around other families who are facing very trying times. We have become close with one other couple in particular. Their son also has a severe condition of CDH. They have been at CHOP a month longer than us, so they are very familiar with the ups and the downs of this journey. Over the course of the last two days, their whole demeanor has changed as their son's condition worsened. They were faced with tough decisions and questions, such as "How much longer would you like us to continue treatment." If they said yes to more treatment, it could cause long-term developmental issues. Of course, the reason they came to CHOP was to get the best treatment possible to give their son the best chance of survival. They opted to continue treatment. All day, our family prayed for their family. Of course, because of patient confidentiality, we can't find out what has happened. We only know when things have taken a turn for the worse. After a long day of waiting and hoping for some positive news, it came. We are so thrilled that their son is stable tonight after another procedure. The baby's lungs had filled with fluid that needed to be drained. CHOP was concerned enough that they decided to test Jordan as well - just to make sure. Jordan's lungs do not have extra fluids - thank God! Jordan had another day of much needed rest. In fact, he acted more stable after receiving care. Usually, his stats tumble a bit when he's agitated - not today. Daddy even got to change his diaper. Never thought changing a diaper would be so rewarding. Still waiting on those lungs to open up. Mommy and Daddy got to give our son a bath today. Well, a sponge bath at least. We even got to change Jordan's diaper. Mommy was very nervous to change the diaper - it's not every day you change a diaper of a baby on ECMO. The nurses were so excited to help us out and take part in his first bath. We would post a picture of bath time but Daddy was busy video taping and not taking pictures. Jordan looked much better today. 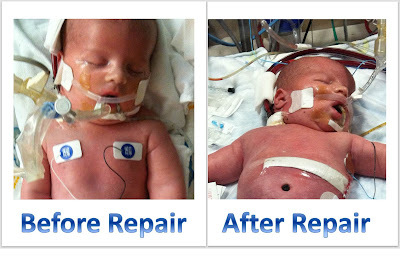 He has lost much of the extra fluids he gained going on ECMO. We also heard some exciting news from a nurse practioner. The area where the trachea splits into the left and right bronchial tubes (which eventually split into smaller tubes within the lungs) has opened up. This area was collapsed just yesterday. This is an early indication that the lungs are opening up. The whole purpose of ECMO is to allow the lungs to open and the pulmonary vessels to relax and heal. The lungs may begin to open up in the next few days. At birth, we take our first breath and it fills our lungs and expands the airways. For babies with CDH, they simulate this by inserting a breath of air in the lungs. The lungs can then collapse as the pulmonary hypertension causes so many issues wih breathing. Jordan's lungs collapsed and his heart was overworked. Once his lungs open up, they will wait to see when his heart and pulmonary vessels are ready to give this another shot. Another very good day for Jordan. Update: We were later informed that it is ECMO itself that causes the lungs to close as a result of the inflammation. ECMO only allows the body to rest; it does not heal anything. In fact, Jordan's body is now recovering from going on ECMO. Once the fluids in his chest cavity lower to a normal amount, his lungs will open back up. We had chills down our back as Jordan opened his eyes and looked at us. It was truly the first time since birth that Jordan really looked at our faces and appeared to be awake. Our second born son - as loved as our first but in a special new way. He is different than Caleb and has his own personality. How can you not fall in love with those eyes? Jordan was nice and snug today as he used hospital blankets like a body pillow. Brandi joked that he looked like mommy when she was pregnant with him. She used a body pillow every night to stay comfortable. He got much needed rest and needed only three rescues today; as compared to every two hours yesterday. "My hope for my children must be that they respond to the still, small voice of God in their own hearts." As we mentioned before, we are beginning to adjust to our temporary home - the Ronald McDonald House of Philadelphia. It was the very first Ronald McDonald House. You are not allowed into this house unless you have a child at CHOP that requires a hospital stay. It is about a twenty minute walk from the hospital and shuttles are available to take us back and forth every few hours. As you can see in the photos below, the house is large and built for families with children. There are two large play areas - one for small children and one for older kids (Caleb enjoys being one of the big kids, of course). He has made a couple of friends who also enjoy trains. The house has a small train table and a large, automated toy train that is customized to match the holiday season. The house is manned by volunteers who love to work for the house. There are guards, a cleaning crew, a social worker, a front desk, etc. Someone is always willing to help out. It is not a hotel - we do not have room service and are expected to clean up after ourselves. It feels a lot like a dorm room. The meals have been fantastic! Someone volunteers each day of the week to cook supper and breakfast is prepared on the weekends. For example, this week we have been provided German sausage, soups, chili, souffle and Philly cheesesteaks. It is a motivation to eat when the food is prepared for you. On one hand, it is nice to meet other families and listen to their stories. It is a place where other people understand our current circumstances and it provides an opportunity for us to be with our son as much as possible. On the other hand, it is difficult to comprehend so many different struggles that families from all walks of life are facing. It is unfortunate that so many families need this type of care. The motto around here is that this is the house that love built. We definitely appreciate the opportunity to be close to Jordan so that our family can spend as much time with him as possible. To the relief of his parents, Jordan has had a pretty non-eventful day. This afternoon, he finally decided he was going to rest. He has been sleeping most of the afternoon and into this evening. They talked about changing his medications, but he remains on morphine. It is mostly watch and wait at this point. Jordan is showing his personality again today by flexing his muscles a bit. He continues to fight - even on ECMO! The ECMO circuit is providing life support for baby Jordan - he has all the oxygen he needs. Today, however, he has continued to try and breath on his own! The staff continues to be baffled by his drive/toughness. Everyone was trying to figure out the best way to get Jordan to relax. After several different experiments, Jordan seems to have won the battle and has gotten his way. They may continue to let him make these motions as they try to find the "right" level of sedation. No matter what they've tried, he is determined to do some of the work on his own. They don't want to sedate him too much because the motion is good exercise for his muscles and helps relieve some of the extra fluids he's gained. All of his vitals look very good today. We were fortunate enough to have the whole process, including ECMO, explained to us in more detail today. At this point, they are trying to let his lungs and heart relax so that the pulmonary vessels can rest and open up. They believe Jordan has enough lung volume based on his first few days of life on the ventilator. However, his pulmonary vessels are easily constricted and don't allow for an efficient exchange of oxygen. That is his biggest threat at this point. ECMO is allowing those vessels time to rest and heal to give this another shot. Over time, ECMO should allow his lungs to open up as well. From the x-rays and tweaks to the ECMO machine, they can determine when is the opportune time to take him off of ECMO and try the ventilator again. Once stable, they can do the repair. Again, the repair is essential for long-term growth of the lungs and organ function. But, in the short-term, the critical factor for Jordan is the pulmonary hypertension. The difference before ECMO is that the baby has too many new things the body is trying adjust to. His heart just got too tired. Overall, this was another good day for Jordan. He has responded to ECMO extremely well. As you can see below, he has shed much of the extra fluid he gained from ECMO. He is peeing well, which is a great sign and makes for good laughs for the nurses (he got one of them today). You can also see in the picture that he is positioned much the same way he was in the womb. His fists are up and he likes to put his left hand up to his mouth.